This innovative, non invasive attachment system was designed to remove the need for using button stud when applying insecticidal ear tags to cattle. 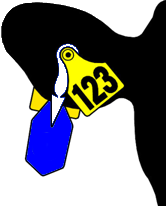 The Attachatag ® Arrow Tag is fitted onto the existing identification tag. Then simple hook on a compatible Fly control blade. The arrow is produced from UV resistant hard wearing plastic and once fitted can remain in place for the life of the animal. So you only have to cut off and replace the fly blade each season. It has been used for many years in the Netherlands, Germany, Denmark & Sweden in partnership with Virbac, Pfizer (Fort Dodge) and Pharmaxin. This innovative, non-invasive attachment system was designed to remove the need for using a button stud when applying insecticidal ear tags to cattle. The Attachatag improves animal welfare. The Attachatag arrow is fitted onto the existing I.D. Tag. Then simply hook on a compatible Fly-control blade. The arrow is produced from a U.V. resistant hardwearing plastic and once fitted can remain in place for the life of the animal. You then only have to cut off and replace the fly blades each season. Please contact Sterimatic to discuss your requirements. Sorry there is no video available of this item yet.